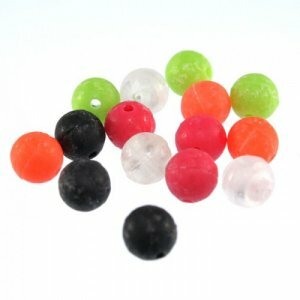 Bayou Sonar Ballzz (6mm, 15pk.) [BR0006] - $4.79 : The Tackle Trap, Inc., It's all about fishing tackle! A quick and effective way to add sound to your presentation, the Bayou Rattlers Sonar Ballzz are sure to give your baits a boost. Made using a 6mm multi-chamber bead, the Bayou Rattlers Sonar Ballzz contain 6 ball bearings that generate a whirling, buzzing sound. Molded with a hole straight through the middle, the Bayou Rattlers Sonar Ballzz can be added inline with almost any lure to provide an added bit of attraction. Perfect for stashing in small compartments, stowaways, and pockets, the HogFarmer Baits Sonar Ballzz provide a fast and effective means of adding sound to your presentation.